Hey, remember last week when excellent actor-specializing-in-complex-villains Garret Dillahunt teased that he might be involved in The Walking Dead? Well, that didn’t happen. So instead the hit zombie series cast an even more perfect actor for the role. 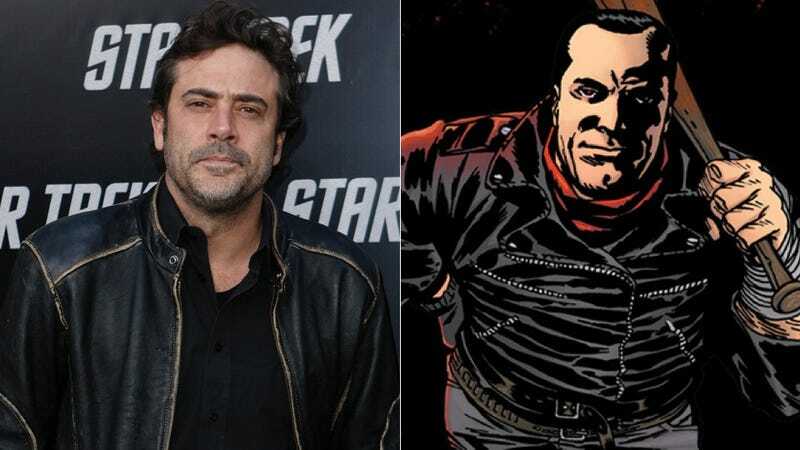 Jeffrey Dean Morgan has officially been cast as Negan, the next big bad that will menace Rick and the inhabitants of Alexandria. I guess it’s arguable whether Morgan has the same level of talent as Dillahunt, although even if not, Morgan is definitely no slouch. However, Morgan has had experience playing the same type of disturbingly upbeat, larger-than-life villain as Negan—namely his role as the Comedian in the Watchmen movie, in which he was pitch-perfect. Plus, although both characters are terrible, awful people, they both have a code—no, that’s not right— they both have a few lines they won’t cross, which makes them compelling even as they do supremely awful things. Negan is absolutely, 100% in Morgan’s wheelhouse.